How effective the system delivers water to a field from a water source is a major contributor to the performance of an irrigation system. Several terms, including water conveyance efficiency, water application efficiency, soil water storage efficiency, overall irrigation efficiency, and effective irrigation efficiency, have been used to assess the performance of a system (Irmak et al., 2011). 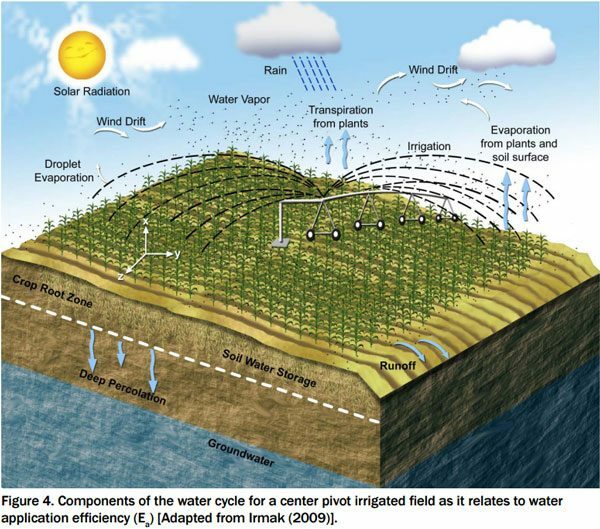 Less-efficient systems usually require greater irrigation amounts to meet crop evapotranspiration (ET) demands due to water loss between the source and the crop as compared to more efficient systems. This results in increased energy use and operational cost for the producer. Several efficiency terms will be described; however, the reader is directed to the references below for further information regarding different efficiency terms. Water application efficiency is affected, in part, by irrigation management. 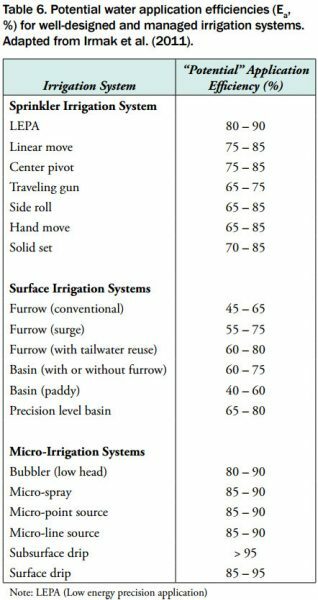 Table 6 provides typical Ea values for well-designed and managed irrigation systems. It is possible to have high Ea values yet unsatisfactory system performance if the irrigation system does not meet crop ET demands. A small amount of irrigation under low atmospheric evaporative demand can result in minimal water loss (i.e., high Ea), yet not meet crop ET demand, resulting in crop water stress. Table 6 provides a good estimate of the upper limit achievable for different system types under well-managed conditions in which crop ET demands are met. Other factors to consider when calculating and assessing Ea are the accuracy of measuring stored irrigation water, effective crop rooting depth, and spatial variability in Ea. Spatial variability in Ea can be, in part, attributed to poor water distribution of an irrigation system. Reporting both Ea and water distribution uniformity provides a better indication of overall irrigation system performance. Additional readings, listed below, will provide further information on factors impacting Ea. Burt, C.M., A.J. Clemmens, T.S. Strelkoff, K.H. Solomon, R.D. Bliesner, L.A. Hardy, T.A. Howell, and D.E. Eisenhauer. 1997. Irrigation performance measures: Efficiency and Uniformity. Journal of Irrigation and Drainage Engineering. 123(6): 423-442. Howell, T.A. 2003. Irrigation Efficiency. Encyclopedia of Water Science. DOI: 10.1081/E-EWS120010252. Irmak, S. 2009. Estimating crop evapotranspiration from reference evapotranspiration and crop coefficients. University of Nebraska-Lincoln Extension NebGuide G1994. Irmak, S., L.O. Odhiambo, W.L. Kranz, and D.E. Eisenhauer. 2011. Irrigation efficiency and uniformity, and crop water use efficiency. University of Nebraska-Lincoln Extension Circular EC732. Irmak, S. and D.R. Rudnick. 2014. Corn soil-water extraction and effective rooting depth. University of Nebraska-Lincoln NebGuide G2245. Rudnick, D.R., K. Djaman, and S. Irmak. 2015. Performance and hysteresis analyses of capacitance and electrical resistance sensors in a silt-loam soil. Transactions of the ASABE (in press).